You are here: Home > How Do I Calculate the Inflation Rate? The formula for calculating the Inflation Rate using the Consumer Price Index (CPI) is relatively simple. Every month the Bureau of Labor Statistics (BLS) surveys thousands of prices all over the country and generates the CPI or (Consumer Price Index). If you don't know it, you can find it here: Consumer Price Index 1913-Present. Assume for the sake of simplicity that the index consists of one item and that in 1984 that item cost $1.00. The BLS pegged the index in 1984 at 100* (see Footnote). In January of 2006 that same item would probably cost $1.98 and today it would cost even more. But let's calculate the price difference between 1984 and 2006. If you don't care how it's done and just want to calculate the difference in prices between two different dates use the CPI Inflation Calculator. 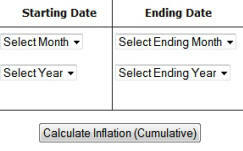 If you want to calculate the percent inflation between two dates (down to the month) use our cumulative inflation calculator. By looking at the above example, common sense would tell us that the index increased (it went from 100 to 198). The question is how much has it increased? To calculate the change we would take the second number (198) and subtract the first number (100). The result would be 98. So we know that from 1984 until 2006 prices increased (Inflated) by 98 points. But, what good does knowing that it moved 98 points do? Well, we know that prices almost doubled in 22 years, since it was 100 1984 and in 2006 it is almost 200 but other than that we don't know much. We still need something to compare it to. Since we know the increase in the Consumer Price Index we still need to compare it to something, so we compare it to the price it started at (100). We do that by dividing the increase by the first price or 98/100. the result is (.98). So the result is a 98% increase in prices since 1984. That is interesting but (other than being the date of George Orwell's famous novel) to most people today 1984 is not particularly significant. Normally, we want to know how much prices have increased since last year, or since we bought our house, or graduated College (or High School) or perhaps how much prices will increase by the time we retire or our kids go to college. Fortunately, The method of calculating Inflation is the same, no matter what time period we desire. We just substitute a different value for the first one. So if we want to know how much prices have increased over the last 12 months (the commonly published inflation rate number) we would subtract last year's Consumer Price Index from the current index and divide by last year's number and multiply the result by 100 and add a % sign. Where "A" is the Starting number and "B" is the ending number. 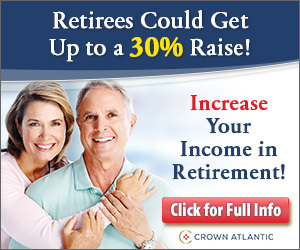 which equals 3.93% inflation over the sample year. (Not Actual Inflation Rates). Note that it contains two key numbers the Current CPI Index (in the top portion) and the Current Inflation rate in the bottom half. To calculate the Current Inflation Rate it uses the most recently released CPI data and compares it to data from exactly 12 months prior using the above formula. To find the CPI index on more than the current date you can check the Historical CPI Data which lists the CPI index all the way back to 1913. If you would like to know the annual inflation rate for any given year see the Current Inflation Rate or Historical Inflation Rates in table format. If you don't care about the mechanics and just want the answer, use our CPI - Inflation Calculator. Or if you believe a picture is worth a thousand words you may prefer just to look at the Annual Inflation Rate plotted in Chart format or Average Annual Inflation Rates by Decade. which equals negative inflation over the sample year of -2.11%. Of course negative inflation is called deflation. In April of 2006 the CPI index crossed the 200 mark so inflation was now over 100% so calculating it became a bit more confusing (but the formula is still the same). Typically when the index crosses over 100% the BLS just sets a new base year making some arbitrary date now equal to 100 and adjusting all the previous dates accordingly. But so far they haven't done that yet. 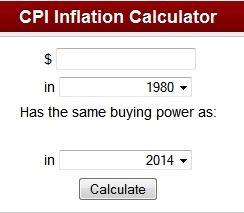 In September of 2012 the CPI index was 231.407 so if we wanted to calculate the amount of inflation from 1984 until September of 2012, we would take (231.407 - 100)/100 = 1.31407 or 131.407%. So prices inflated by 131.4% in that time period. The calculations are the same but we have to remember that the 131% increase is on top of the original price. 100% inflation means prices doubled. 200% inflation means prices tripled, etc. Somehow it just seems less confusing when total inflation is less than 100%. Misery Index- A combination of inflation and unemployment makes people miserable. *Footnote: Although for simplicity we say the index was set at 100 in 1984 it was actually set at 100 for an average period from 1982 -1984 so there is no specific month when the index was exactly 100.